There is always a first time, and it happened with this book. I was working my way through it, page by page, marking recipes with stickies. I had used a lot of stickies when I finally got to page 31. I don’t quite remember, but I think I actually gasped. I took the book, called my wife, and showed her the recipe that was surprising me. I will post the recipe later this week with our picture. This dish could not have been grander if we were eating in the best Indian restaurant in London. The texture, spices, and glorious flavors were as powerful as, well, gunpowder. 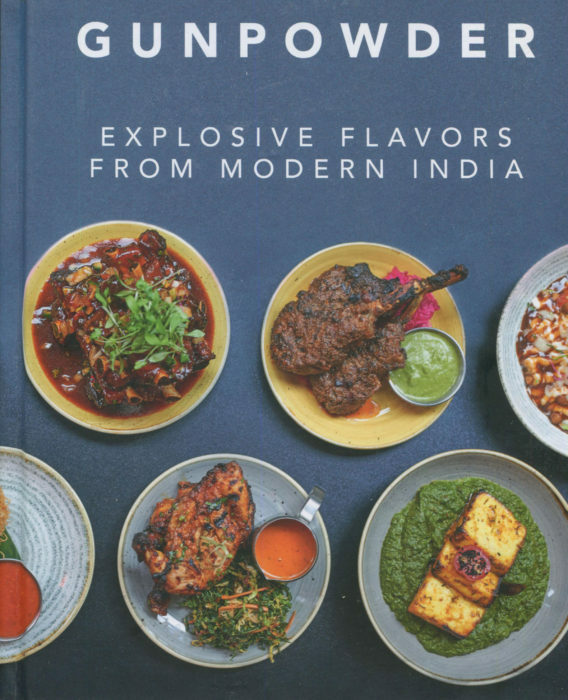 Gunpowder is the name of both this cookbook and the London restaurant founded by three persons who came from Kolkata. Kolkata? That’s the new name for what you probably know as Calcutta, a bastion of culture in the far eastern segment of India, right on the border with Bangladesh. Harneet Baweja, his wife Devina and friend and chef Nirmal Save took the journey many have. They grew up in India feasting on family recipes and the daily treats of street food. Then to London, a small restaurant space, and glowing tributes. Gunpowder is a compendium of family favorites and street marvels. This broccoli recipe is typical of the book. Oh, don’t worry: this book is not vegetarian, and you’ll find tandoori chicken, but you’ll want to linger over the veggies, too. 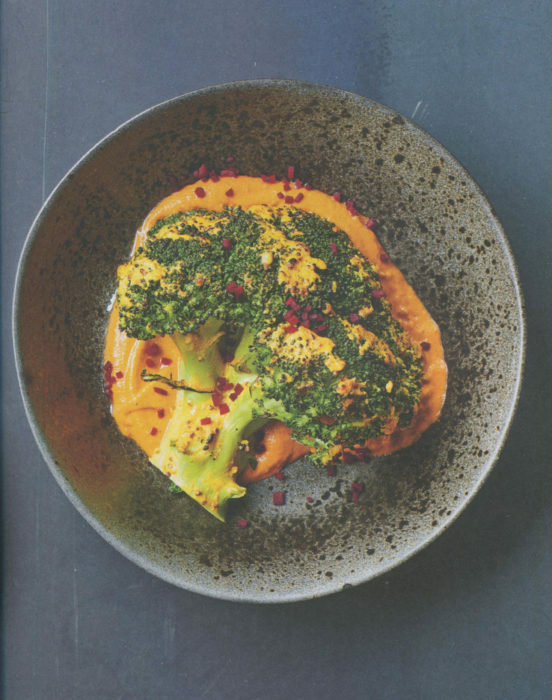 That broccoli is marinated in a mixture of yogurt, cream cheese, mustard, chile powder, chaat masal, turmeric, coriander, and cumin. After cooking for 30 minutes, the broccoli sits on a bed of Makhani Sauce, a blend of garlic, ginger, tomatoes, fenugreek, cumin, cloves, cardamom, pepper, chile powder, nutmeg, heavy cream and honey. This dish is heavenly. Now, it takes a few ingredients and some time to reach heaven, but, oh my God, is it worth it. Gunpowder will delight you. Yes, you’ll do a little shopping. Yes, your kitchen will fill with the most wonderful aromas. Yes, you’ll need a beer or two. Yes, it’s a wonder. Oh, the name? Gunpowder is slang for, what else, a spice mix. The recipe is right there in the book, and the authors happily suggest you put gunpowder on everything. It’s an Indian cookbook after all, full of the heat and headiness of a great culinary culture. Gunpowder is a perfect example.